Manuel A. Vasquez’s research on the intersection between Christianity and the diverse economic, political and cultural signs of globalization is strikingly innovative. Vasquez recently co-directed a ground-breaking three-year study of churches in Peru and El Salvador and among Salvadorans and Peruvians in the U.S. This work led to the book Christianity, Social Change, and Globalization in the Americas, for which Vasquez co-authored four chapters. Building on the success of that project, he now co-directs a multi-year research project on “Latino Migrants in Florida: Lived Religion, Space, and Power.” He is studying religious and cultural networks among Guatemalans, Mexicans and Brazilians in South Florida, as well as tracing migration routes from the countries of origin to the United States. In addition, Vasquez argues that the increase and intensification of global flows of people, ideas and capital are generating new hybrid forms of Christianity that challenge traditional understandings of religion. His book on this, Globalizing the Sacred, will be the focus of a panel at the next meeting of the American Academy of Religion. 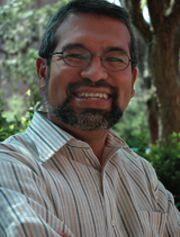 Vasquez has recently signed a contract with Oxford University Press for a book on theory in religious studies.